In today's Graph of the Week, we display some data gathered by ACT that shows how large numbers Ohio high school graduates interested in science, technology, engineering, mathematics, and medical study completed high school without being ready for college work in those areas. The study identifies three groups of students with an apparent interest in STEM: those with an "expressed" interest, those with a "measured" interest, and those with both expressed and measured interest. How do these groups differ? Essentially, a student who has an expressed interest in STEM [has chosen] a major or occupation (out of the 294 listed in the Standard Profile Section of the ACT) that corresponds with STEM fields. A measured interest utilizes the ACT interest inventory, an inventory delivered with the ACT that determines inherent interest in different occupations and majors. "Expressed and measured" means that the student's interest shows up both directly in the standard profile and indirectly in the interest inventory. The complete study is available from ACT's web site. 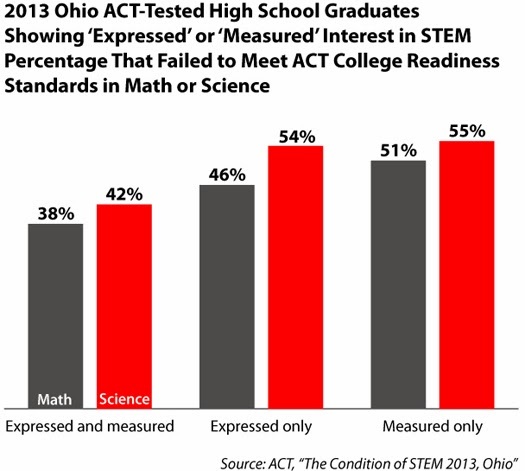 By the way, Ohio's students are better prepared for STEM study than the nation as a whole.